Shannon Campbell, president and event coordinator, explains that there is a particularly strong comic fanbase in Vancouver. VanCAF started with 3,200 attendees in 2012, the year of its launch. Over the course of two years, it has more than doubled, hosting 8,000 attendees in 2014. This year, VanCAF is expecting approximately 10,000 attendees from all over the Lower Mainland, and is doubling the number of exhibitors from 92 in 2012 to 260. “Anyone can walk in. We always get those people every year who had no idea it was even happening and just walk in off the street,” says Campbell. The free admission makes VanCAF attractive to not only comic lovers but to anyone who’s looking for a fun afternoon out. “It’s easy to also just look at things like the Marvel movies – hugely successful and hugely accessible – but also even smaller indie projects are just kind of opening comics for everyone who might not have read comics before,” says Campbell. VanCAF contributes to the overall comic scene in Vancouver by introducing people to the artform. As a free event, VanCAF draws in people who otherwise would not attend. “I think Vancouver definitely has a market for it, but what’s large in Vancouver is the indie scene. We have an appetite for indie comics up the West Coast, especially in Portland and Seattle as well,” adds Campbell. Because of VanCAF’s increasing popularity, the festival’s growth will soon become stunted, even with the generosity of the Roundhouse Community Centre, the location of this year’s event. 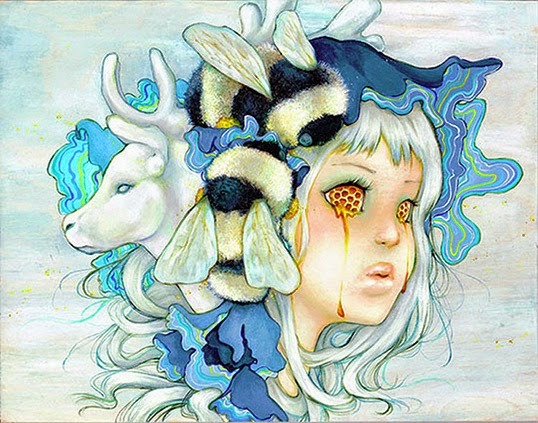 VanCAF has been a home to comic artist Camilla D’Errico’s work since 2012. A Vancouver-based urban contemporary painter, illustrator, character creator and more, D’Errico has become a top name in Vancouver’s comic world. D’Errico’s work can be found on toys, accessories, clothes and more. Published by companies such as Random House, Tokyopop, Boom! Studios, Image Comics, IDW and Dark Horse, D’Errico also produces her own books, such as her most recent publication, Tanpopo. The Vancouver Comic Arts Festival will run May 23–24 at the Roundhouse Community Centre.